DoliCloud is an Opened hosting solution. This means, you can view, modified and download program and data files. One of the interfaces to keep control on your data is Secure FTP (SFTP). SFTP is a convenient and secure means of accessing your instance code. 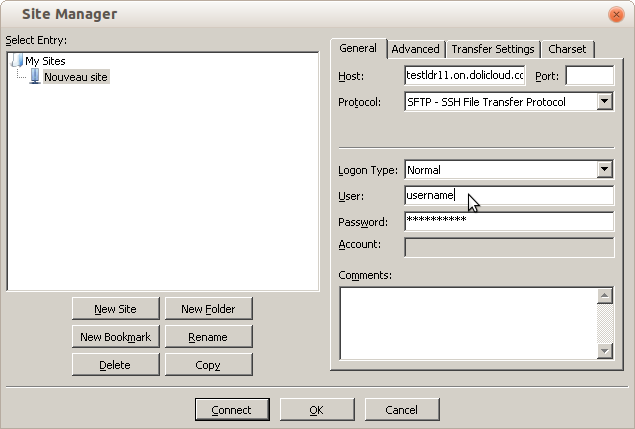 WinSCP and FileZilla are very common SFtp client for Windows. But any SFTP client is a good choice. 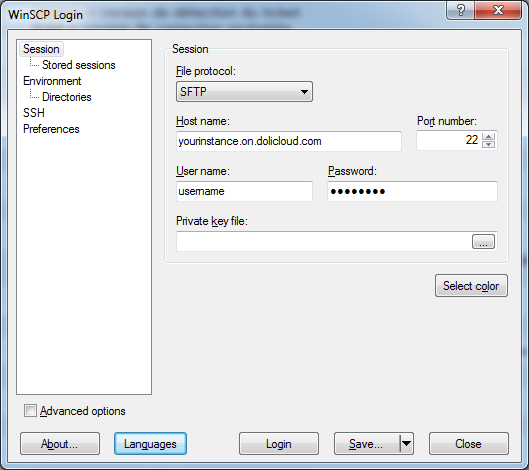 This page describes how to setup your SFTP client. - Click on menu "My applications & Options". - You will find credentials to connect using Sftp on by clicking on the tab "SSH / SFTP". You will find hostname, username and password. For Windows users using FileZilla. - Select protocol SFTP and report server name and your credential (see first chapter) as visible into this screenshot. Keep Port field empty. Click onto "Connect" and you should see a window with an explorer to drag and drop files from one side (your computer) to the other (the DoliCloud server). For Windows users using WinSCP. - Select protocol SFTP and report name server and your credential (see first chapter) as visible into this screenshot. Keep value 22 into "Port number" field and keep "Private key file" empty.